The new Bluegrass Horse Feeds product, Bluegrass Turmash has been designed to promote weight gain and condition, adding to the range of scientifically formulated products within the Bluegrass Horse Feeds range. Let’s look at what’s inside this new mash and find out which horse it is suitable for. 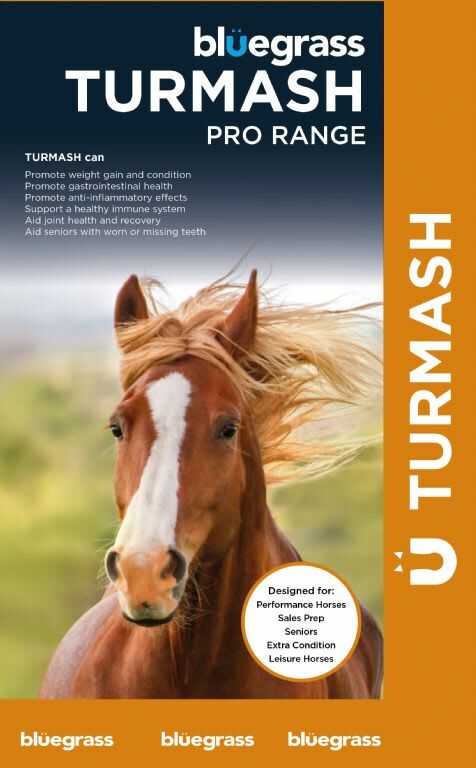 Firstly, what does Turmash contain and how will it benefit our horses? Bluegrass Turmash contains high quality digestible fibres including sugar beet, in fact this mash has a 20% fibre content. Higher fibre in our horses’ diets provides alternative energy sources to cereals and promotes gastrointestinal health helping to avoid digestive issues such as gastric ulcers. With the addition of linseed oil, slow release energy sources make this mash non-heating. Linseed has a high omega 3 content promoting joint health, a glossy coat and extra condition. Curcumin is a natural polyphenolic compound derived from the spice turmeric. Fortified within the Bluegrass Turmash, turmeric is known as a natural dietary antioxidant and to have anti-inflammatory effects. Diseases such as laminitis and osteoarthritis have been known to benefit from the anti-inflammatory properties of this brightly coloured spice. What are the main benefits of feeding Bluegrass Turmash? Quick soaking taking only 15 to 20 minutes to soak. At feeding time the convenience of speedy soaking takes away the hassle of waiting around or pre-soaking feeds the day before. The high palatability of Bluegrass Turmash makes this ideal to encourage water intake when travelling or competing. Incorporating electrolytes or medication into the mash will help disguise the taste for “fuzzy” eaters. Ideal for senior horses with missing or worn teeth struggling to eat and gain condition. The added turmeric and linseed will promote their immune system and joint health. Bluegrass Turmash is a fully balanced feed, it is recommended to allow access to other forage sources when feeding Turmash. Bluegrass Turmash has a low starch content and due to the slow release energy sources has a non-heating effect perfect for “fizzy” temperaments. Bluegrass Turmash has been formulated in conjunction with Kentucky Equine Research, the quick soaking, conditioning mash if fully balanced with the highest quality of vitamins and minerals. If you require any further advice on feeding complete our diet form to receive a tailored diet from our highly experienced equine feed consultants.